Ridley Pearson, the first American to be awarded the Raymond Chandler/Fulbright Fellowship in Detective Fiction at Wadham College, Oxford University, is the bestselling author of over 50 novels including, Peter And the Starcatchers (co-written with Dave Barry), The Kingdom Keepers series, and two dozen crime novels including: Probable Cause, Beyond Recognition, Killer Weekend, The Risk Agent, and The Red Room. His novel The Diary Of Ellen Rimbauer, a prequel to a Stephen King miniseries, was a New York Times #1 bestseller, and a ABC TV movie (2009). Peter and the Starcatcher, a stage play adaptation written by Rick Elice (Jersey Boys) won 5 Tonys for its Broadway run and is currently touring the US. 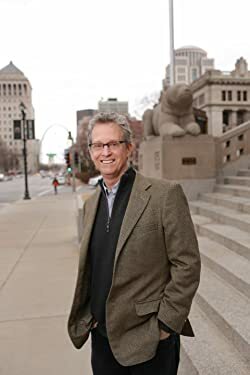 Ridley is a founding member of, and plays bass guitar in, the all-author rock band, The Rockbottom Remainders, with Dave Barry, Stephen King, Scott Turow, Mitch Albom, Roy Blount Jr., James McBride, Amy Tan and Greg Iles. The band has raised over 2.5 million dollars for charities. Learn more at Ridley Pearson’s website. Click here for more stories by Ridley Pearson. Starcatchers — (2004-2011) Ages 9-12. With Dave Barry. Publisher: Follow the adventures of Peter, Molly, Tinker Bell, and the Lost Boys in these Peter Pan prequels: In an evocative and fast-paced adventure on the high seas and on a faraway island, an orphan boy named Peter and his mysterious new friend, Molly, overcome bands of pirates and thieves in their quest to keep a fantastical secret safe and save the world from evil. Award-winning authors Dave Barry and Ridley Pearson have turned back the clock and revealed a wonderful story that precedes J. M. Barrie’s beloved Peter Pan. 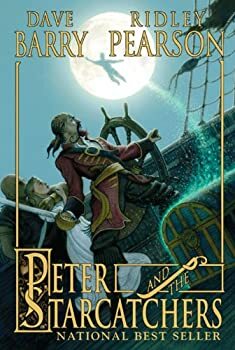 Peter and the Starcatchers is brimming with richly developed characters, from the scary but somehow familiar Black Stache and the ferocious Mister Grin to the sweet but sophisticated Molly and the fearless Peter. Page after page of riveting adventures take readers on a journey from a filthy, crime-ridden port in old England across the turbulent seas. Aboard the Never Land is a trunk that holds a magical substance that amazes — just a sprinkle, and wounds heal; just a dusting, and people can fly. Roiling seas and dangerous thunderstorms are the backdrop for battles at sea. Bone-crushing waves eventually land our characters on Prawn Island — where the action really heats up. This impossible-to-put-down tale leads readers on an unforgettable journey, fraught with danger yet filled with mystical and magical things. How did Peter Pan get to Neverland? Where did Tinkerbell come from? How did Hook lose his hand? And most importantly, how did Captain Hook and Peter Pan meet? This last question is the one Paige Pearson asked her father after hearing "Peter Pan," which in turn led to Dave Barry and Ridley Pearson's collaborative effort Peter and the Starcatchers, written as a prequel to J.M. Barrie's classic work of children's literature. Kingdom Keepers — (2005-2015) Ages 9-12. Publisher: When Disney comes looking for five teenagers to serve as actors for a new technology — Daylight Hologram Images, or DHIs — there is more to it than meets the eye. Strange things have been happening inside the Florida park: parts from one ride are found mysteriously moved to another; in the Fantasmic! show, the dragon unexplainably triumphs over Mickey; little blips in story lines and “offstage” antics by characters trouble managers. Finn Whitman, a middle-schooler, goes to sleep one night and has the dream of a lifetime: he “wakes up” inside Disney World as his DHI character, a glowing hologram. He meets an old man there, Wayne, who claims to be one of the original Imagineers and explains to Finn that he “and your friends” have a mission to save the park from forces that humans can neither see nor hear. Not believing his dream, but not totally discounting it, Finn, back in real life, sets out to find the four other kids who were chosen to be DHIs and in doing so he learns an eerie fact: he is not alone in this “dream.” The others have had similar experiences. What if this is for real? CLICK HERE FOR MORE KINGDOM KEEPERS STORIES. Neverland — (2006-2008) Ages 9-12. With Dave Barry. Publisher: Little Scallop should be happy. She’s a princess of the Mollusk tribe, rulers of beautiful Mollusk Island. And she has two fun friends — Aqua and Surf — who just happen to be mermaids. But Little Scallop is bored. Her warrior brothers are allowed to do exciting things, like spying on the pirates who live on the other side of the island. Little Scallop longs to have a real adventure. When Aqua and Surf invite her to go pearl-diving — even though she knows she shouldn’t — she can’t resist. So late one night, she sneaks off into forbidden waters with Aqua and Surf. That’s when the trouble starts — they run into a fierce storm and a strange ship sailed by men who would love to capture a mermaid. Soon, Little Scallop is caught up in the adventure she always wanted. The question is: can she and her friends get out of it? CLICK HERE FOR MORE BOOKS BY RIDLEY PEARSON.